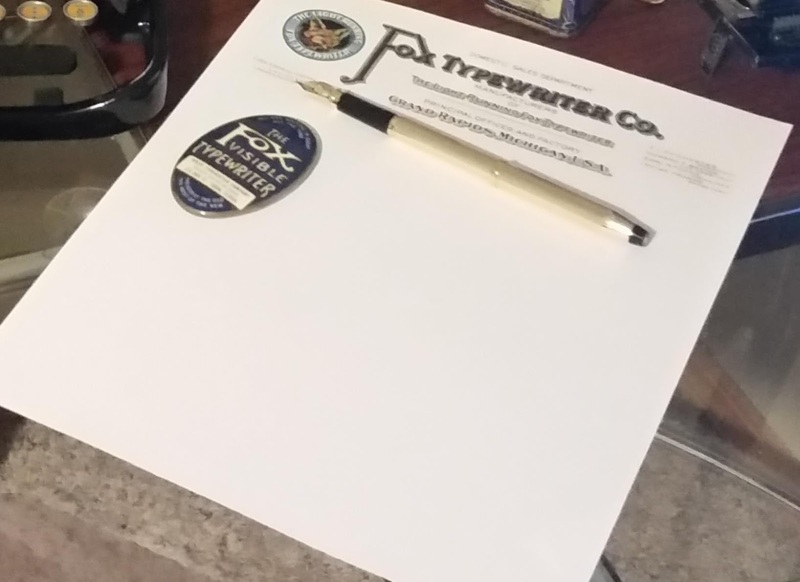 Letterheads, spinning tops and rubber feet; Oh My. I'm not usually all that interested in grabbing ephemera, though certain things do nab my attention. One of those things happens to be typewriter letterhead from the old company's. Now, normally even when interested, I wont try all that hard to get a letterhead. There's only one brand I would normally go nuts for, and the rest are sort of a "If I win it, cool. If not, oh well.". There is one thing that impacts my interest in such a thing on a level that's not so much about the typewriters or the brands themselves. As the old saying goes... its all about location, location, location. These letterheads were down in California. And They didn't belong down there. They certainly didn't belong on the East Coast (where I'm sure most ephemera collectors are based on population density). They belonged back in the land where they were intended to be in the first place. The mythical, the magical, the Land O' Potatoes: Idaho. North Idaho, more specifically. These two letters were sent, long ago, to Lewiston, which is just a short drive south of me, and which happens to be the home of my Collegiate Alma Mater. I clearly had to bring them home. And so I did. I have digital, printable blank forms for two of the Fox styles, but sadly no actual letters. Someday, someday. Speaking of Fox, I finally got one of these normally overpriced spinning tops. I won't lie, I had an odd bit of fun when I spun it as fast as I could. Now, it sits with my other Fox ephemera. On another front, I finally decided to splurge on the well renowned services of one Mr. Steven Dade, and requisitioned some new rubber feet for my Sterling. Suffice it to say that Mr. Dade does incredible work, incredibly fast, and at an incredibly reasonable rate. These reproductions were a near perfect fit, and my Sterling now sits level and stable on the table. One of the original feet was still in good shape. The others did their best to imitate pancakes. What's in a picture? Let me count the (arguably Fox related) things. In truth, this picture sums me up pretty bloody well. While it might take someone with an eagle eye to truly spot it, it turns out that I like old things. 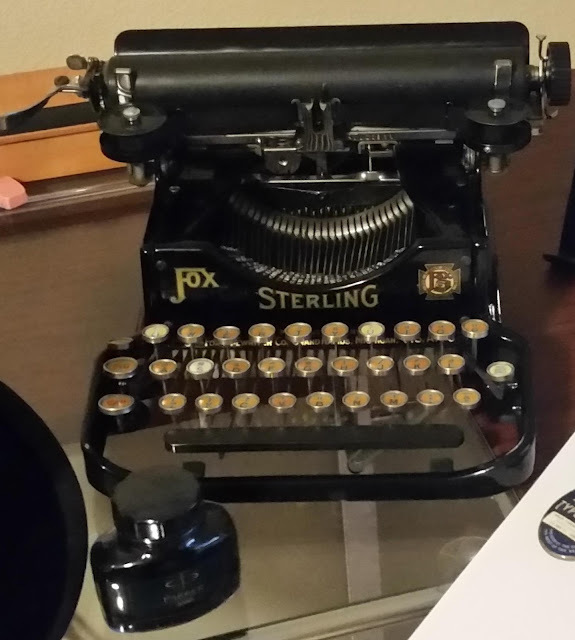 Typewriters have become my true hobby in regards to that, but I'm always fascinated with other antique devices, and older ways of doing things. My preference generally stays around the early 1900s, however, so while I think quills and crossbows are cool, I don't really have a desire to own or use them. But lets take a look at this really Fox based photograph, shall we? On the right, we have a Kodak Junior. This thing takes a film roll size that no longer exists, so I had to grab some adapters to allow smaller, still produced film rolls to be utilized. I havent really taken too many photos with it, and had fewer of those actually developed. But I can tell you its a great bit of fun to do so, and end up with authentic black and white pictures. A bit pricey, being about 5 bucks for a roll that will fit about 12 pictures, and about 7 bucks to process said roll. I'm a bit interested in learning to develop pictures myself to cut costs. Kodak used to actually offer a personal kit to do so back in the day. Next up based on random order, the main point of the picture. A Fox Sterling! You may not know this... but I really like Fox machines. And this mint condition Sterling has been a cornerstone of my collection for some time now. I like using it, and it always proves its motto; The Light Running Fox! And of course, not all ink comes in ribbon form. A bottle of black Parker Quink ensures my pens always have a source of the necessary stuff. 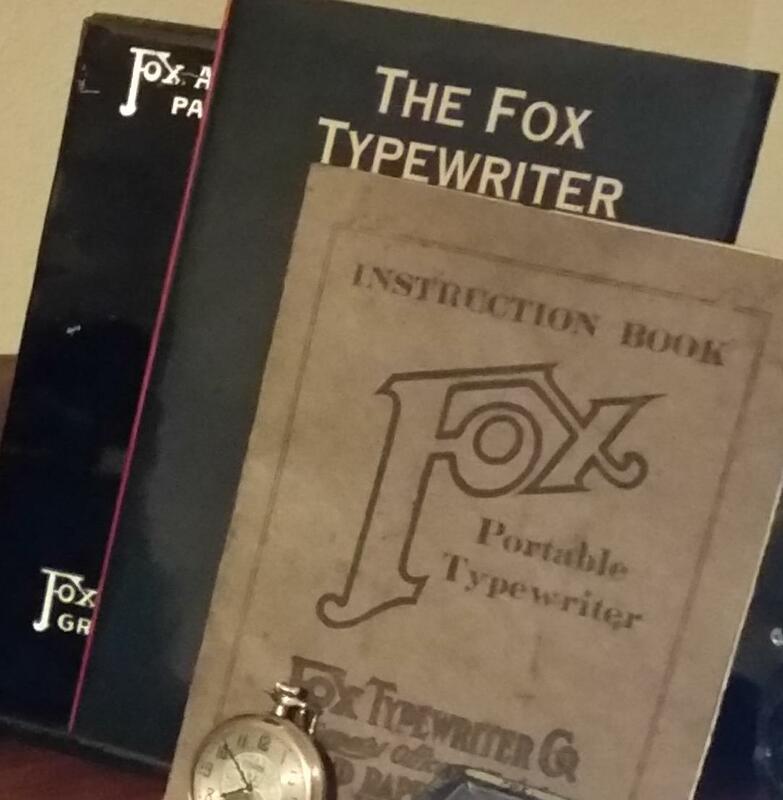 Now what better to go with a Fox typewriter, than a Fox Copyholder, a Fox book, and a Fox portable manual? 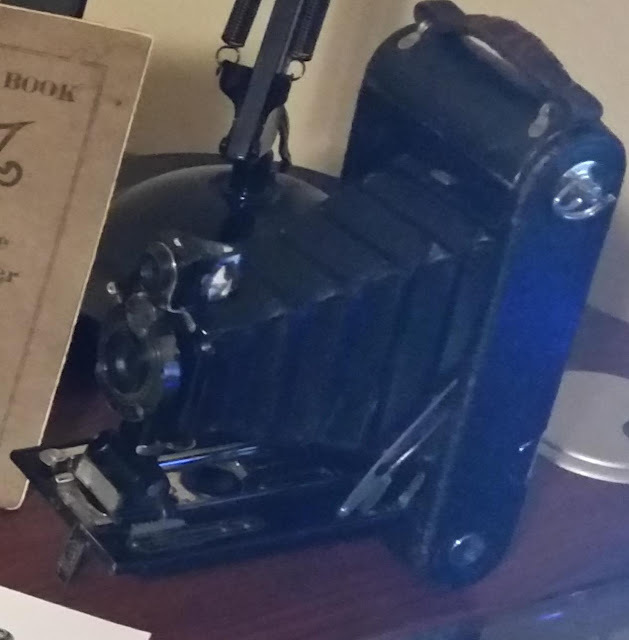 I have two of the copyholders, one in worse condition which I use everyday, and one in wonderful condition that sits in a display case. They are both the kind meant to be attached to a desktop machine via long extension arm (which I do not possess, and have only seen one of). There is a stand based version that I would be ecstatic to find. The book is some silly little thing that's filled with utter gibberish. Read at your own risk. The manual is something interesting. It has a very thick, heavy cover that has helped protect it over the years, and nice glossy pages. The instructions are worded in a very proper and professional way, and despite owning two for the folding machines, I own none for the Sterling. If you have one for said Sterling, you are certainly lucky. 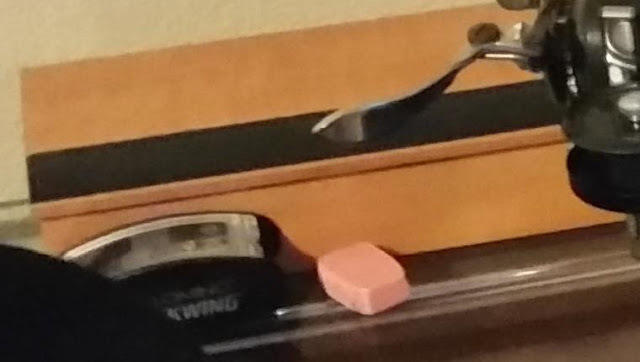 Hidden in the back and definitely not truly a part of the picture, you may notice a pink eraser. Oh, and a box of Palomino Blackwing pencils. Honestly, if you ever have a few bucks you dont mind wasting on a pencil, you should try a Palomino Blackwing (602 for writing, standard for drawing). They're the highest quality pencil I've ever dealt with. Pencils aside, we have more Fox stuff. And a not Fox thing. 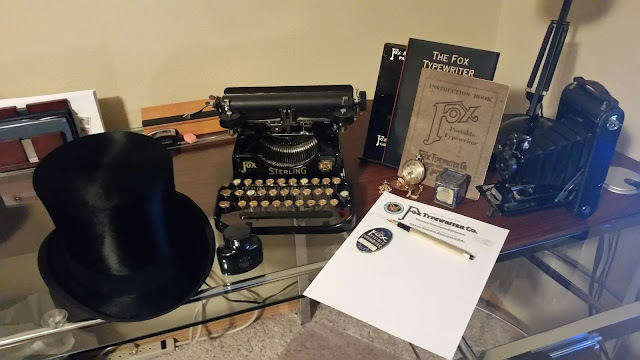 The Fox letterhead is thanks to a blog post by Richard Polt at The Typewriter Revolution (and I think originally due to Peter Weil scanning a letter he has). Colorful, it adds a touch of pure awesomeness to my personal letters. Said letters always look amazingly authentic on it, as well, which just makes it all the better. To the left, you have a small Fox branded mirror. These don't crop up often, and seem to go for around a non-president Founding Father, give or take a few Secretary of the Treasury's. Theyre quite small in reality, especially when compared to some that Remington made. And what early 1900's picture would be complete without a fountain pen? A college graduation gift, the gold-filled fountain pen will last me a long time, and writes as lightly and smoothly as one can ever dream of. Worth 15 bonus points, according to one master of the item-points market, the top hat is in neigh perfect condition. 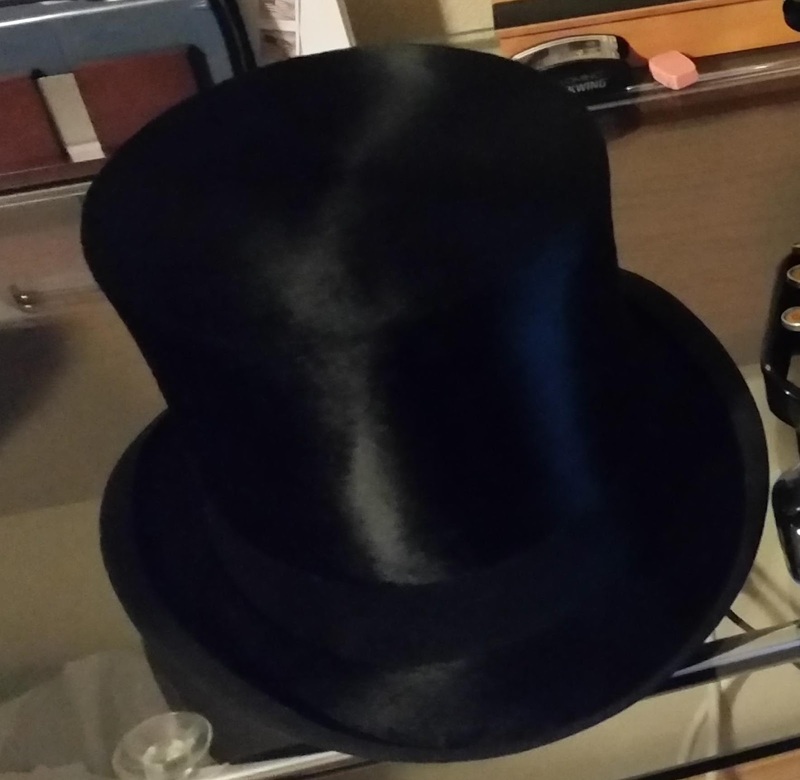 I went through two other top hats trying to find one that fit right, getting a bigger size each time. Turns out, people back int he day had smaller heads or something. I love how they look (though theyre out of place unless worn with a vest or suit), but sadly I haven't had the chance to wear this one anywhere. I bought it in the hopes of using it at one of my best friends weddings, but being the best man, I was forbidden from doing so by the friends new missus. Alas. Then we have the pocket watch and ribbon tin. If not for pocket watches, I wouldn't have stumbled into the typewriter hobby. And without a hatred of the confining feeling of a wristwatch, I never would have stumbled onto pocket watches and their just perfect magnificence. Wristwatches got nothing on the classiness of a gold-filled Elgin. I havent yet acquired a ribbon tin for a visible machine, but I have somehow ended up with two of these blind ribbon tins. Very artfully done, I wish things still came in well designed small tins like it. Ok. So. Despite ALL my research into this bloody brand. Despite EVERYTHING. I somehow never really realized that Fox had branded oil bottles. I saw Typewriter Oil mentioned in the portables manual, but since it wasnt actually labeled Fox Typewriter Oil (like the Fox Ribbon was just above it), I assumed that they just took some generic third party oil and shipped it. Nobodys ever mentioned this stuff, and I've certainly never seen it anywhere. Ever. This is my first acquisition of the year, and I am beyond ecstatic. On top of existing, it came with its awesome little box which is just as amazing, and certainly has to be on the rare side since cardboard stuff from that era just wasnt meant to be kept once you opened it up. AND. I got it for a fraction of what I would have been insane enough to throw at it. Either nobody else is quite as nuts as I am about this brand (thats a given), or everybody who cares about impossible to find ephemera was looking away from the ebay listings when this thing went through. I'm just floored overall that I now have this in my possession. I can also tell you it predates 1917. The price on the bottle is 15 cents, but the portable manual has it listed for 20. A 33% increase in price must have been drastic back then.